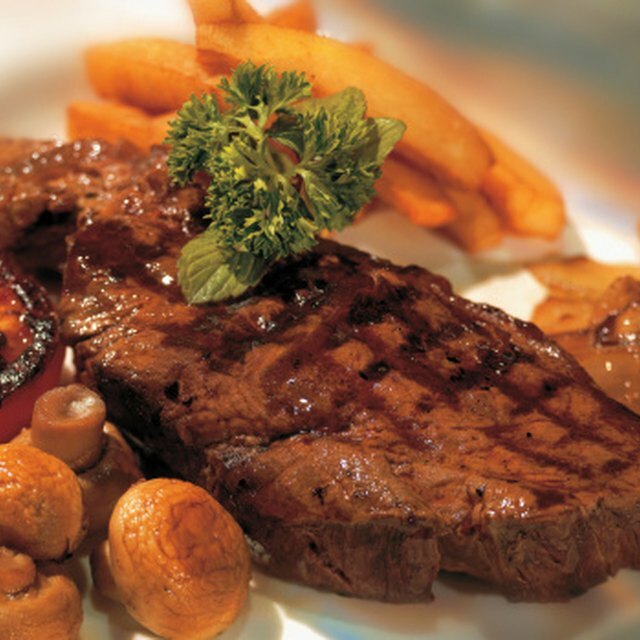 Steak is a classic for special occasions. While it might not be a meal for the whole family, a steak dinner is a wonderful way for the two of you to celebrate a birthday, raise, or anniversary. The perfect steak dinner starts with a steak cooked to your taste, along with favorite sides and something sweet to finish. Steak dinners can be pulled together with minimal prep work, making them ideal when you want something special, but time is tight. Start your steak dinner with a steakhouse classic: an iceberg wedge salad. This salad pairs well with steak and requires nothing more than a head of iceberg lettuce, some chopped tomato, a few green onions, and crumbled blue cheese and bacon, plus your favorite blue cheese dressing. Replace the blue cheese with cheddar and the blue cheese dressing with ranch or creamy peppercorn if you're not a fan of blue cheese. Serve the salad alongside dinner or as a first course. Choose a choice cut from the rib or loin for a tender, quick-cooking steak. Look for steaks that are at least 1 inch thick, with white flecks throughout the meat for a tender and delicious main course. You can cook steaks outside on the grill, inside on a ridged grill pan, or under your broiler. An instant-read meat thermometer makes cooking the perfect steak easy. 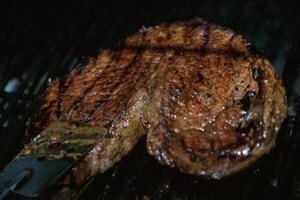 To avoid ruining your perfect steak dinner with a bout of food poisoning, follow the USDA's guidelines for cooking meat. Make sure your steak reaches an internal temperature of at least 145 degrees F. If you prefer your steak well-done, aim for 160. While a baked potato and salad can round out your steak dinner easily, you can also opt to dress up your sides. Try a potato gratin, or serve mashed potatoes with bacon and cheese in place of the usual baked spud. You can forgo the potatoes altogether and just have fun with homemade onion rings. Sauteed mushrooms, caramelized cauliflower, and creamed spinach are all good choices to add to a steak plate if you have extra time. Drizzle the vegetables with the same creamy dressing you used on your salad for a bit of extra flavor. Choose your favorites for dessert. A steak dinner pairs equally well with a dense chocolate brownie or cake, warm apple pie, or something light, like poached pears or chocolate dipped strawberries. Make a busy evening easier by picking up dessert at the bakery on your way home. If everyone's full from dinner, try serving dessert an hour or two later, rather than immediately after the meal.